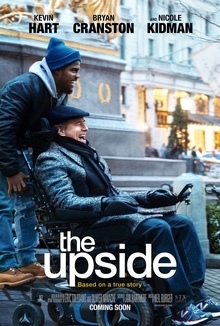 I recently attended the cinema to watch the movie The Upside, a film showcasing the quirky relationship between a health caregiver played by Kevin Hart and his boss living with quadriplegia played by Bryan Cranston. Hollywood was able to interject bits of humor making fun of the intricacies of their relationship and the challenges that a quadriplegic must endure on a daily basis. So it only made sense that I watch the movie with two of my caregivers, preparing ourselves for a lot of laughter and making fun of "all of the things" associated with being a quadriplegic such as I am. Little did I know that I was setting myself up for an unexpected reaction, as I rolled away more down then up. The movie is based on a real-life story, originally filmed in the French cinema with a movie called The Untouchables. This modern-day American version portrays Bryan Cranston's character as a very wealthy man who is injured in a hang gliding accident breaking his neck at the highest level leaving him completely paralyzed from the neck down, similar to Christopher Reeve. Quadriplegics cannot walk, stand, run, feed themselves, get in/out of bed, take a shower themselves, brush their teeth, drive a car, etc. "quads" need help with literally everything. Because of these extreme needs, quads have caregivers that assist in all human functional activities; it's a difficult job to maintain, as the requirements of a patient, kind and reliable caregiver are constant. Caregivers are often behind-the-scenes, individuals who do everything for their clients and are not recognized enough, as they are not in the limelight. Even so, these incredibly important human beings are our lifelines; a healthy and prosperous life would not be possible without them. As a quadriplegic myself, and past life physical therapist, I immediately recognized some inaccuracies in the movie such as with wheelchair equipment like how Bryan Cranston as a full quadriplegic was able to maintain his arms in between his knees when being pushed around in the community in a manual chair by Kevin Hart. This is impossible because a quadriplegic has no control over their arms and hands and need to be positioned in the appropriate armrests or the arms, hands and especially fingers can very easily get caught in the spokes of the wheels of the wheelchair causing injury to the lower extremities. This can be very dangerous as a quadriplegic cannot feel their arms, hands, and fingers and so, therefore, must be closely monitored by the caregiver. Kevin Hart seemed clueless. In another scene, an entire pot of hot coffee spills in Bryan Cranston's lap as he exclaims he cannot feel it, I cringed thinking of the ensuing burn. Of course, the movie doesn't go there. And lastly, as Kevin Hart is speeding through city streets in a flashy sports car where Bryan Cranston sits in the passenger side – all quads know the near impossibility of getting into and being supported in a small bucket car seat – they evade a speeding ticket as Bryan Cranston foams at the mouth to the ticketing police officer scaring him into letting them go free. For the life of me, I cannot understand why there is a connection between being a quadriplegic and foaming at the mouth. I'm a quadriplegic and I have never foamed at the mouth and to date I have never seen another quad foam at the mouth. Why portray that? All of these things are really inconsequential in the end as it is good exposure to the general public about what entails being a quadriplegic on a daily basis, even if it's just a bird's eye view from Hollywood's cameras. Kevin Hart as a caregiver was encouraging independence, life improvement, and finding laughter in extremely tough situations. So kudos in that realm, but unbeknownst to me the next day I found myself unexpectedly sideways about this undertone of making fun of people in wheelchairs that are completely paralyzed especially because of their extreme needs. I found myself unable to laugh at myself because, for the first time, this didn't seem like the right reaction. Maybe because I was sitting in my wheelchair essentially viewing myself and my life in a giant mirror camouflaged as a theater screen; it was my life staring at me through Hollywood's eyes. I'm still not entirely sure how I feel about this film – partly because of the inaccuracies but partly because it seemed like the humor and laughter was directed at me instead of with me. I keep thinking what would've made me feel better and I think the final realization I had is I should've watched this movie in an entire movie theater with people who are quadriplegics sitting in their power wheelchairs side-by-side. Then it would've been funny, then we could have laughed together about all of our difficulties and insane life challenges, then we would have collectively found our "upside". Unfortunately, I think it might be a long time, if ever before I sit in a movie theater when everyone around me is in a wheelchair. And in all honesty, I would never want that… Because more importantly, who would be there to shove popcorn in my mouth? That's the flip side of my upside.